With the optional addition of humidity control, extended time lapse observations are now possible with the LiveCell TM system: a completely integrated and easy to use stage top incubation system for inverted microscopes. 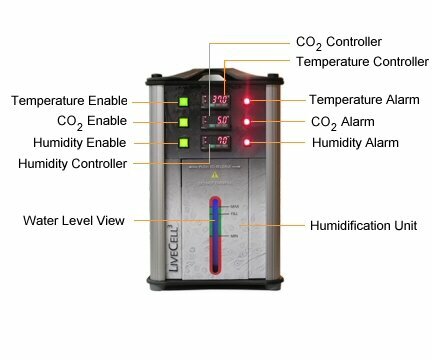 At the push of a button you have adjustable, precise, and stable control over the Temperature, %CO2, and Humidity without the need for expensive pre-mixed gas, flow rate adjustments, or excessive evaporative loss of media during long observations. 5 day worry free walk away time. No tools required to install and run. Chamber is small yet large enough for nearly all sample configurations. Each function can be disabled. Controller can be located up to 6 feet from the chamber. Easily transported to other labs. Fits NIKON, OLYMPUS, LEICA, and ZEISS. 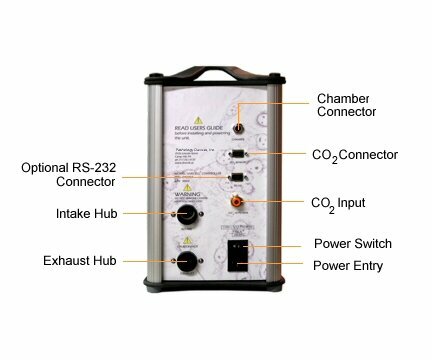 Accommodates various working distance condensers. Differential Interference Contrast (DIC), fluorescence, and Phase Contrast imaging are all possible. Temperature control to 50.0 °C. Temperature stability +/- 0.1 °C. Temperature response time 5 sec. %CO2 control to 10.0% +/- 0.1%. %CO2 accuracy +/- 2% of max. %CO2 response time 20 sec. %RH control to 100% +/- 1%. %RH accuracy +/- 2% max. %RH response time 15 sec. Power 110 VAC-50/60 Hz @ 2.36 A. Optional Power 220 VAC-50/60 Hz @ 1.3 A. Warm up and stabilization time < 30 min. For detailed specifications, pricing, and features please download the brochure and Users Guide.